A trip to Burgundy isn’t complete with a meal or two at the Bistro de l’Hôtel, where proprietor Johan Björklund serves seasonal cuisine in a gorgeous, intimate setting. I love being in Burgundy, but the truth is that the food starts to get a bit heavy after a few days. How much jambon persillé, escargots and foie gras can a person eat? That is one of the reasons I enjoy going to the Bistro de l’Hôtel. There are plenty of opportunities to indulge. At the same time, the Bistro offers a number of delicious but simpler dishes that make it easy to go back often. 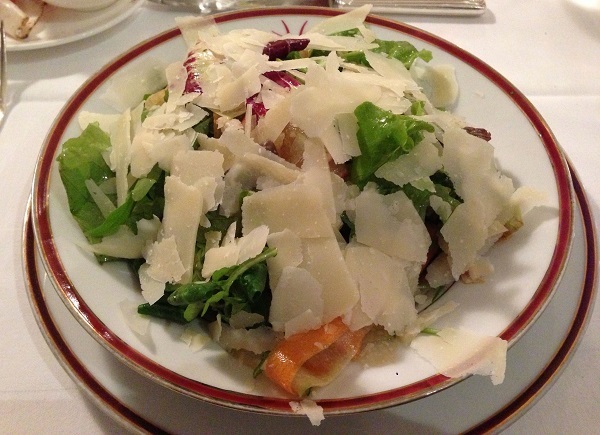 One of my favorites is the mesclun salad with shaved parmesan, which is wonderfully invigorating after a day of tasting in the cellars. The same salad is available with shaved black truffles, a marvelous treat to be sure. Our line-caught bass for two is perfectly cooked. It is also enough food for a small family, but who are we to complain? It is so refreshing to eat a simple, grilled fish as opposed to the butter-drenched versions common in this part of the world that totally cover the essential flavors of the fish itself. 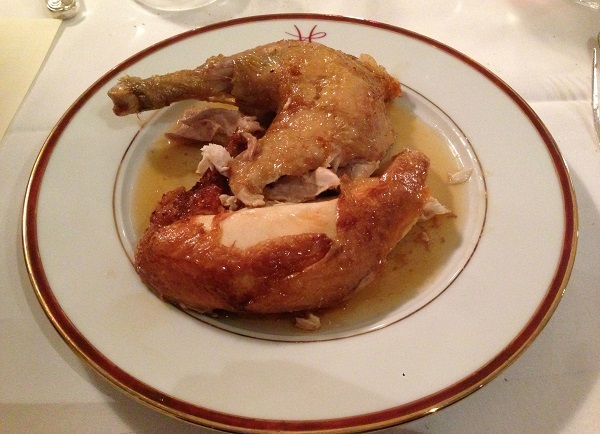 The Poularde de Bresse for two with mashed potatoes and steamed vegetables is comfort food at its very best. What could be better? 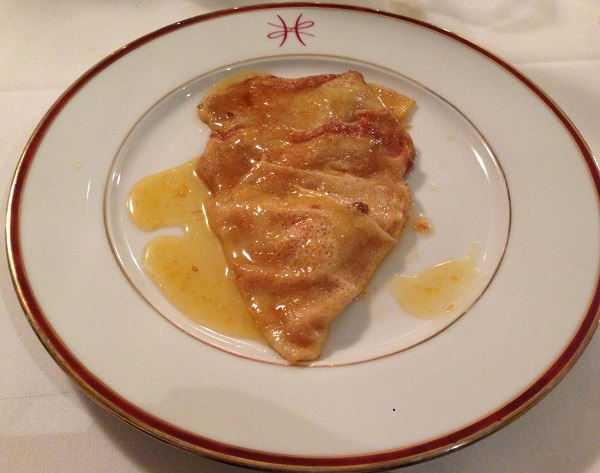 I rarely order dessert, but the Crêpes Suzette, a childhood favorite, are too good to pass up. I bought a fair amount of Raveneau’s 2010 Chablis Montée de Tonnerre, as it is my daughter’s birth year, but haven’t tasted it in a while. Of course the 2010 is much too young, but then again, I rarely see Raveneau wines in restaurants at prices that are approachable. Still very much tightly wound, the 2010 hits the palate with a bevy of crushed rocks, slate, citrus and white stone fruits, all in an energetic style that is going to require time to settle down. There is a lot to look forward to. 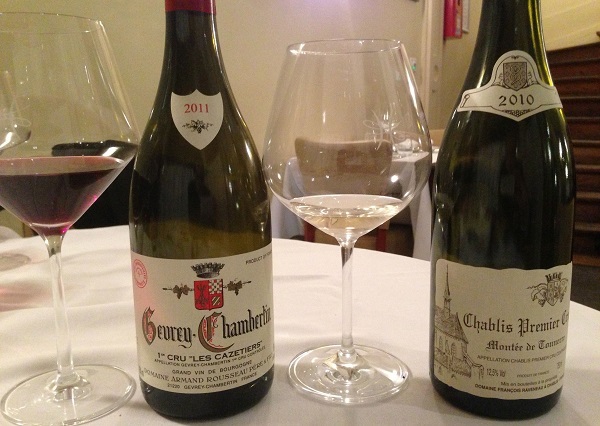 I am intrigued by Rousseau’s 2011 Gevrey-Chambertin Les Cazetiers. I had just tasted at Rousseau a few days before and had a chance to revisit a handful of other 2011s from bottle, all of which were drop-dead gorgeous. Plus I adore wines from Cazetiers, one of the top sites in Gevrey. Sadly, Rousseau’s 2011 Cazetiers is completely reduced at this stage. While that is not totally surprising in young Burgundy, none of the 2011s I tasted at the domaine exhibited any reduction at all, which is why I thought ordering the Cazetiers was a safe choice. It will be interesting to see where the 2011 goes over the coming years, as there is plenty of depth and resonance in the glass. On this night, though, the Cazetiers remains too reduced to deliver any pleasure at all. Readers visiting Burgundy should make a point of checking out the Bistro. 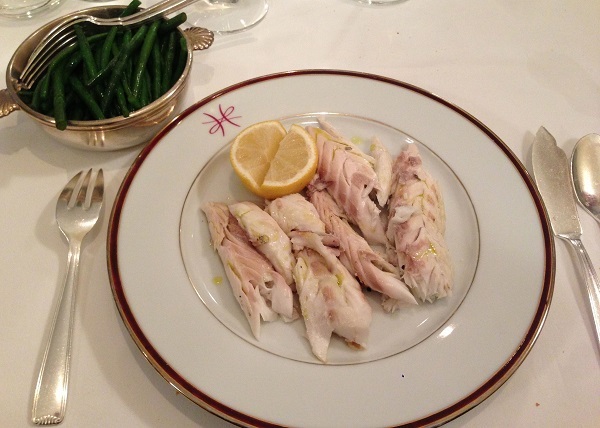 At 40 euros a person, the prix-fixe dinner menu is affordable, and is an option I choose often when dining alone. Ordering à la carte will raise the bill considerably. The Bistro’s wine list is extensive, but there aren’t a lot of values to be found. The most rewarding way to approach the list is to look for wines that have very limited outside distribution, at which point pricing becomes a secondary concern. During the summer months, I suggest enjoying the outside terrace, one of the prettiest and most relaxing spots in Beaune.